KROKUS To Call It A Day With "Adios Amigos Tour"
In 1980, the triumphal march began throughout America, Canada and England. The band cemented their reputation and name as a strong, no-frills live band. Unforgettable headlining tours and on the same bills with great bands like AC/DC, VAN HALEN, RUSH, TED NUGENT, JUDAS PRIEST, MOTORHEAD, just to name a few. Wild times, big adventures, which brought the band, among other things, the honorary citizenship of Memphis Tennessee. 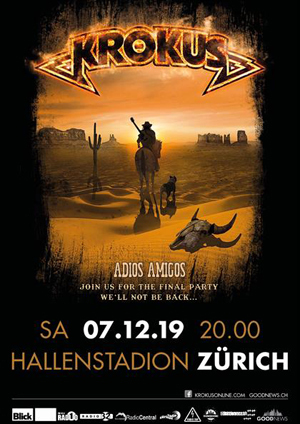 KROKUS were also the first Swiss band to sell-out the Hallenstadion, Zurich in 1982. During our remarkable career, KROKUS rocked more than 2000 shows on five continents - different cities, unique locations, crazy gigs and loyal fans. This long journey ends with our "Adios Amigos Tour". Chris von Rohr: "It was an unparalleled journey with all the ups and downs rock life has to offer. Now we are looking forward to the final lap of honor and will give it our all once more. We owe that to ourselves and our fans. The 7th of December, 2019 will be unforgettable as it was on the 27th of March 1982."